Located North West of Spain. It is the smallest of the chamois subspecies in the world, which leave’s on the Cantabrian mountain range. It is a very challenging animal and his rut is in October and November. Hunting for one of the most gracious animals in Spain - Cantabrian Chamois. Woman, the tours have a discount of the 10%. Family, the discount of the tour is 10%. More than 1 person (Friends), the discount of the tour is 5%. The Cantabrian Chamois inhabits the Cantabrian Mountain Range in the North West of Spain. It is set as a different species from the rest of European Chamois. When compared to the Pyrenean Chamois it is quite smaller concerning its body and its horns, which are thin and short. This hunt can be taken either with a rifle or a bow, although in any case a good shape is required to succeed on this hunt. 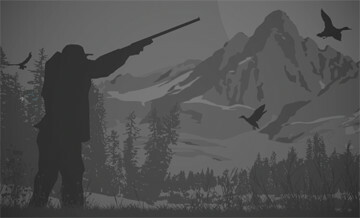 Hunting season goes from May 1st to July 15th and September 1st to November 15th. Best months are July, October and November. All our hunts are run in free range areas.